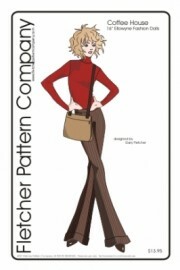 This ensemble includes pattern pieces for a long sleeve knit turle neck with back snap clousure. The extra room and closure allows you to easily slip the shirt over Ellowyne's head. The straight legged cuffed trousers include front mock waistband pocket, mock front button and snap closure. Your own doll will be set to go with her designer laptop bag which features a real working zipper closure, over the shoulder strap and options for buckles. The laptop bag pattern pieces are an extra bonus I thought you would enjoy. The PDF version of this prints on A4 and 8 1/2 x 14 legal size paper. Be sure to pick up the buttons, snaps and buckles when placing your order. We have a large assortment of findings that are the perfect scale for doll sewing and we can send them along with your pattern. It couldn't be easier.